An internal problem makes the character appear fallible – and thus more credible, more human, more like us. Internal problems are invariably emotional and private. They express the inner life of a character, and often reflect our own inner feelings. They are therefore usually far closer to the reality experienced by the recipient of the story, the audience or reader, than the surface structure of the story, which is based on the external problems of the characters. Everybody knows feelings like doubt, fear, pride, desire, anger, etc. We can relate to emotions like that more intensely than we can relate to, say, the work of an FBI agent, the adventures of an archaeologist, even the ordinary life of an Irishman on a June day in 1904. Or rather, we are interested in the work of the FBI agent, the adventures of the archaeologist, the ordinary life of the Irishman because they have emotions that we know. So fairly early on in the story, while the audience or reader is being introduced to the characters, the story may also provide clues about the main character’s internal problem. The character then sets forth on the story journey, hoping to achieve the want and the goal, which the story has also established quite early on. At first, small hindrances turn up that need to be overcome or circumnavigated in order to continue. They may appear as tests. It is vital for the whole concept of the internal problem that in the first few instances where the character bumps into obstacles that challenge the internal problem, the character will fail. These obstacles or tests show the audience/reader as well as the character that the internal problem is jeopardizing the character’s chances of overall success. The problem reveals itself as a negative character trait which will prevent the character from achieving his or her want. 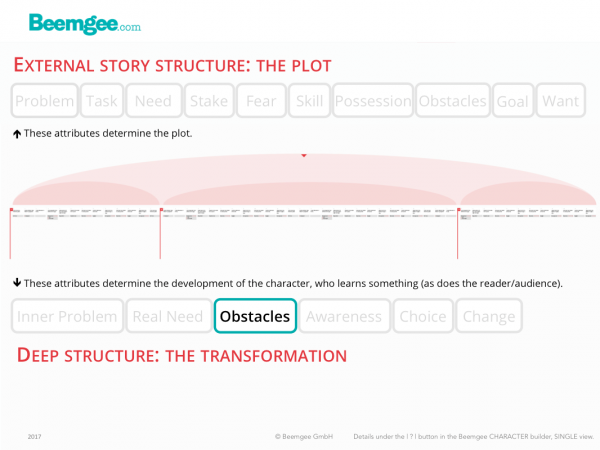 Only if the character can recognize the negativity of the character trait – usually round about the middle of the story – and change it into a positive one towards the end, will the character have overcome the internal obstacle and solved the internal problem. In other words, an internal obstacle is a manifestation of the internal problem. The obstacle shows us, the audience, an instance of how behaviour typical to the character is engendered by the character’s internal problem, and how that hinders the character. Internal obstacles arise as manifestations of the character’s inner problem. They are instances that occur only because of particular character traits the character really needs to address. So if the character’s internal problem is excessive doubt, fear, pride, desire or anger, the first few times the character runs into obstacles, the character will react to them with excessive doubt, fear, pride, desire or anger, and will therefore suffer a setback. Eventually, after an escalation of setbacks, a revelation may occur in the character when he or she recognises the reason why such setbacks occur. At the goal, which is the gateway to the want, the character then faces the final battle with the most massive form of the internal obstacle. By this time, the story may have woven the various sorts of obstacles together, so that the climax is about the character overcoming them all at the same time. Now, what we’ve described here is an archetypal way stories are structured. It sounds a little simplistic when put in abstract terms like this. But look at your favourite stories, whatever they are – however literary and high-brow or popular and entertaining they may be – and you will probably find that the basic gist of the story can be described in such abstract terms. If you want to tell a story, and you are in the process of composition, it might help to set some internal obstacles for your character to overcome. The internal obstacles a character encounters in a story are the consequences of the character’s internal problem. Dealing with these obstacles helps the character to recognize her or his real need.